UK political classes and media are gripped by the ins and outs of the Brexit battle (a referendum of Britain’s continued membership of the European Union is due to be held on June 23rd). 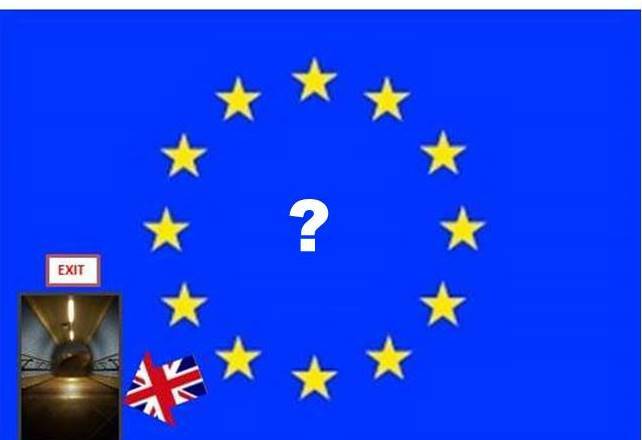 Many other Europeans are baffled, not least because the politics are entangled with a very British Conservative Party leadership struggle, and because both Labour and Conservatives are split on the Brexit issue. But values research from CDSM shows that values differences underly the polarised ‘leave’ or ‘remain’ positions in the UK, and, similar political-values antagonisms are at work in several other EU countries, including on immigration. The UK party specifically associated with Brexit is UKIP. Below is the UKIP vote from around the time of the last election, along with the core readerships of several national newspapers and the Liberal Democrats, longstanding supporters of EU membership. 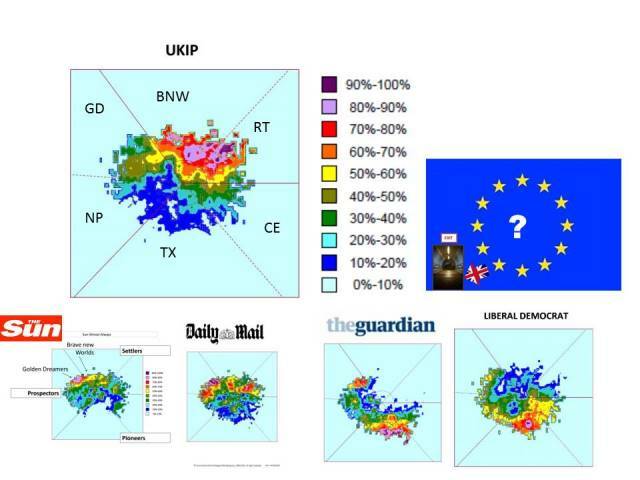 UKIP’s core vote was concentrated in the Settlers (top and top right), overlapping with the base of the Daily Mail and The Sun. The Liberal Democrats and The Guardian mostly show the opposite pattern: their support being concentrated lower right in the Pioneers. In between the two are the Prospectors, likely to be the swing voters in the Referendum (as a previous blog described, values surveys before and at the last election commissioned by John Cruddas MP showed how the Labour Party lost much of the Prospector vote, and lost the election). CDSM’s model is calibrated with the internationally verified values model of Shalom Schwartz. 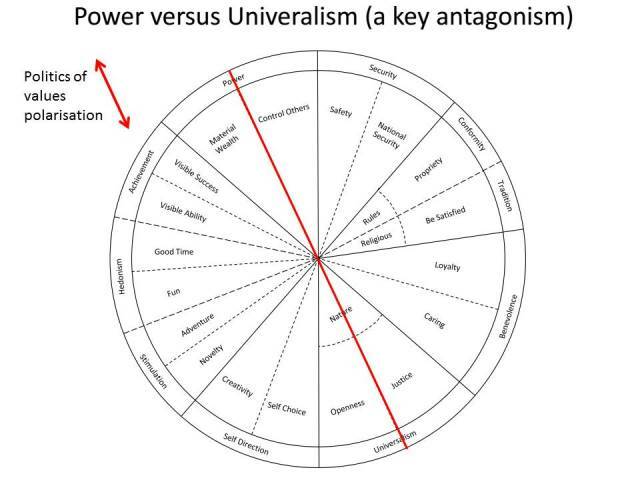 The polar antagonism in values is shown in the red line below: “power” versus “universalism”. Whoever manages to appeal to the values left of this line, such as achievement hedonism, stimulation and self direction, is likely to swing the decision. In political parlance this means establishing a ‘narrative’ of optimism, the prospects of future success, enjoyment and looking good, whether as a country, a business or individually. Further appealing to the ends of this polarity will only entrench it and may even turn off the bulk of Prospectors, leading them to stay away on referendum day. A ‘key issue’ has been immigration. 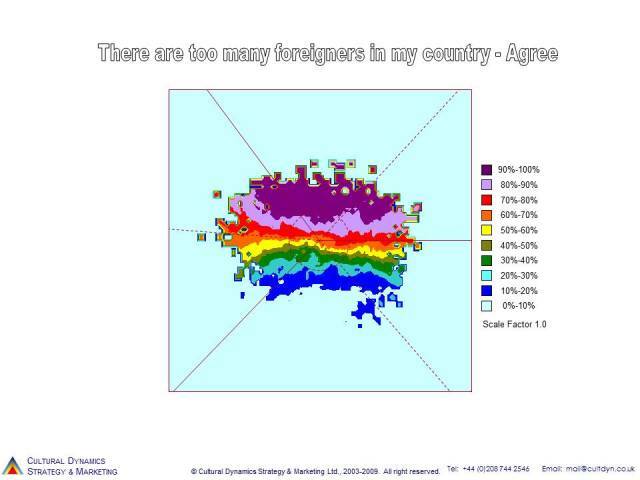 UK Settlers overwhelmingly agree there are ‘too many foreigners’ in the UK. This is a reflexive judgement caused by unmet needs for safety, security and identity, and fear of the unknown. UKIP has successfully played on this concern. Attacking it on universalist grounds and with ‘facts’ will not make any difference, except possibly to drive entrenched views deeper. Only an optimistic success-oriented alternative is likely to make a difference. A key group will be the Golden Dreamers (GDs above), who are in turn very influenced by the Now People (NPs above) Prospectors, who having achieved esteem of others, are role models for GDs. The NPs are more fashionable, confident, optimistic and less disciplinarian. The benefits of Euro-railing, enjoyment of foreign holidays, making friends and having a good time doing business with Europe, and the endorsement of celebrities for the same, are likely to have more effect on this than any amount of ‘economic argument’. In a recent article Alternative for Germany – how far can it go ? 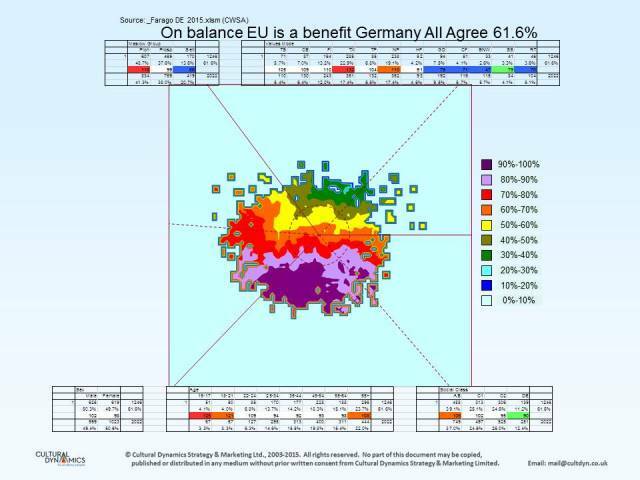 at the CDSM research website shows that the recently successful AfD or Alternative for Deutschland party has a very similar values appeal to UKIP. Such parties are usually called “right wing nationalistic” parties but in truth they are more Settler identity-seeking parties. 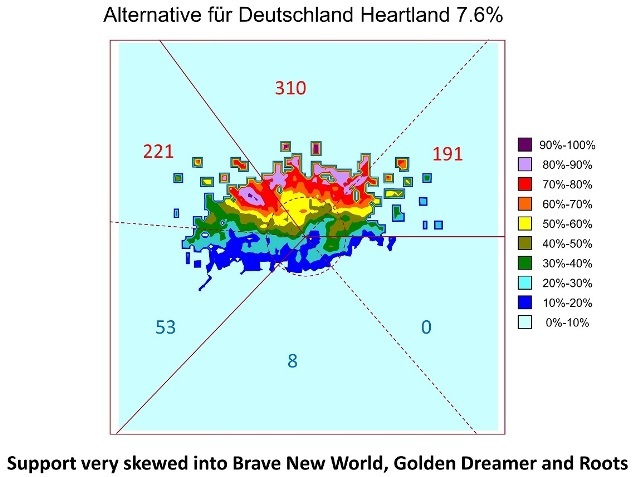 Below: core AfD base in December 2015. ‘significantly increase the size of its franchise in a very short period of time – taking it from a fringe party to one that could have significant part to play in a larger coalition with another party or parties. Perhaps more importantly, AfD is well placed to become the voice of these disenfranchised, alienated, angry and frightened people who may not have voted in the past but now feel that there is a party which understands them. If this is so, and they give AfD their vote, they will change the overall narrative within the whole German political system’. In Britain this opportunity may come on June 23rd if the ‘remain campaign’ does not get its act together. (For more on AfD read Pat Dade’s piece and for anyone who sees a similarity with Donald Trump’s approach in the US, have a look at his older analysis of the Tea Party). 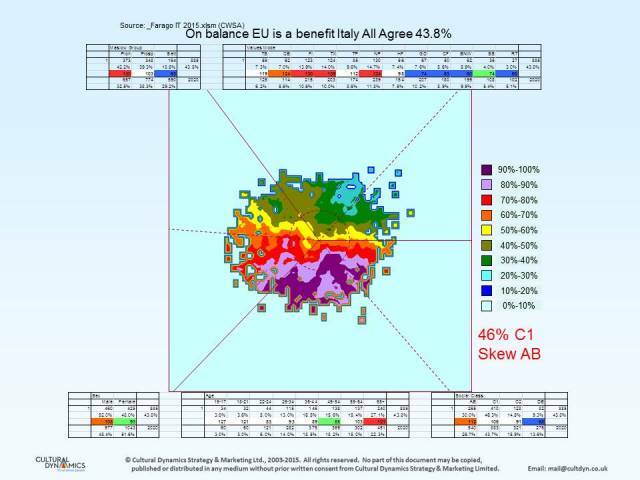 CDSM’s 2015 survey of five EU Member States (UK, Germany, Spain, Italy and France’ – data here) also tested agreement or disagreement (on a six point scale) with the statement ‘On Balance the EU is a Net Benefit’. This is obviously relevant to Brexit and other possible ‘xits. Pat Dade will be posting a proper analysis of this in the next week or so but he has let me have some slides to share here (please contact him directly for more). 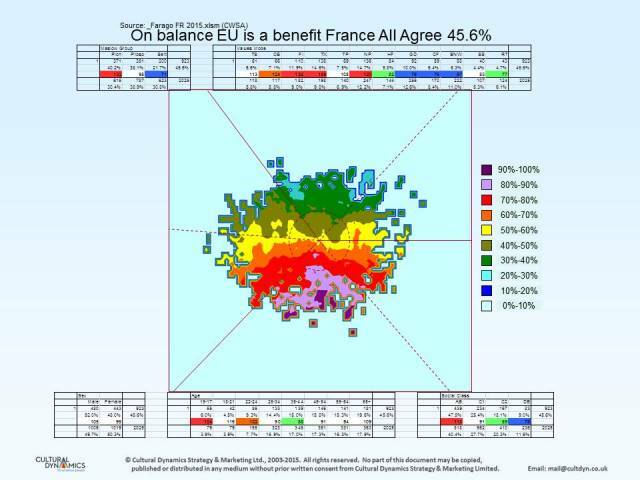 Here are the pro European values maps – those who agree the EU is a net benefit. France: 45.6% overall support and a similar pattern. The Settlers and Golden Dreamer Prospectors are much less supportive than the Pioneers and Now People. Germany: 61.6% agree overall but Settlers much less so. Golden Dreamers are split over the question. Now People and Pioneers agree most. 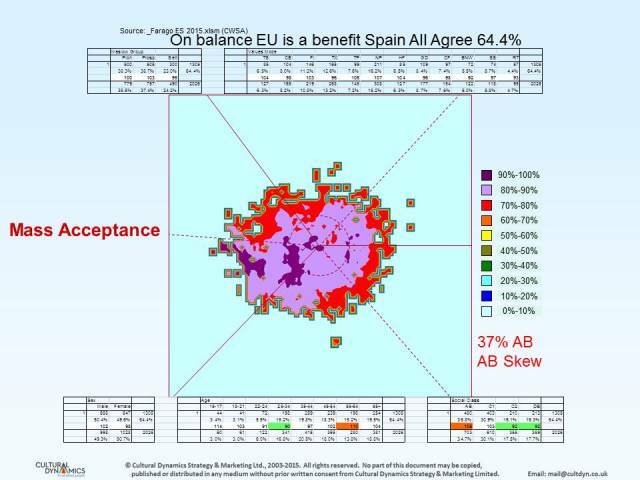 In Spain there is mass acceptance, it’s a mainstream view, although even higher amongst ABs. Finally, back to the land of the Brexit debate: UK. Support for the EU is almost the mirror image of those who most support UKIP and feel there are too many foreigners in the country. 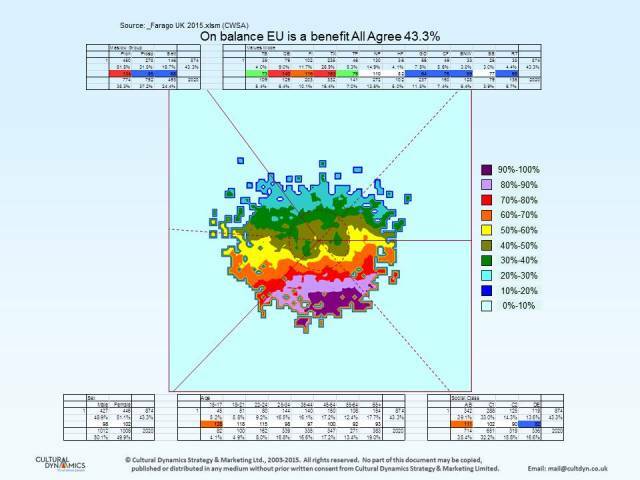 The Now People (lower left) are significantly more pro European than the Golden Dreamers (upper left), showing why this is the key battleground that will probably determine whether Britain votes in or out. Behind these ‘terrain maps’ is a lot more detail which Pat Dade will explore in his forthcoming analysis at www.cultdyn.co.uk, where you can also test your own values using their online questionnaire. 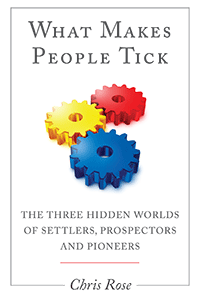 For more on how values shape many issues in our societies see my book (avialble at this page or from Amazon etc) What Makes People Tick: The Three Hidden Worlds of Settlers, Prospectors and Pioneers.